Our summary: we love this company's ethos - they help protect the rainforests by not using any palm oil, they instead use gentle, natural ingredients that work, and they are passionate about minimal packaging so they make all their gorgeous products zero waste without any plastic packaging. 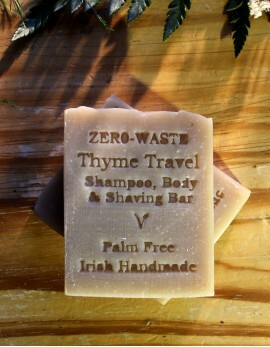 We love the new thyme and lavender shampoo bar for your zero waste bathroom or travel bag. It may take a while for your hair to get used to it, particularly if you live in a hard water area, follow the instructions below for rinsing with apple cider vinegar to restore PH balance while you transition. Scented with an invigorating blend of lavender, geranium and clarifying thyme to revitalise the hair and awaken the senses. A unique shampoo bar that is mild enough for everyday use, yet long lasting and hard enough to cope with the rigours of travel. The Palm Free Soap Co use an extremely high percentage of Fair-trade, organic shea butter, with the addition of panthenol and zinc oxide which together, helps lock in moisture, strengthen hair and soothe sensitive scalps. The addition of organic apple cider vinegar helps create an even milder bar and balance the skin’s pH. No expense has been spared in creating these long lasting moisturising bars, which are the most competitively priced on the market today. Due to its mild creamy texture, this also makes an excellent shaving soap. It may also be used as a normal soap for those with sensitive skin. Panthenol and zinc oxide hydrate and heal, while strengthening hair strands. Organic Apple Cider Vinegar (with the mother) balances pH of hair, reduces frizz and adds shine. 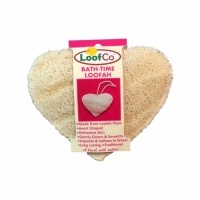 Anti-inflammatory organic marshmallow root & comfrey soothes sensitive skin and speeds healing. Free From SLS, parabens and synthetic fragrances. 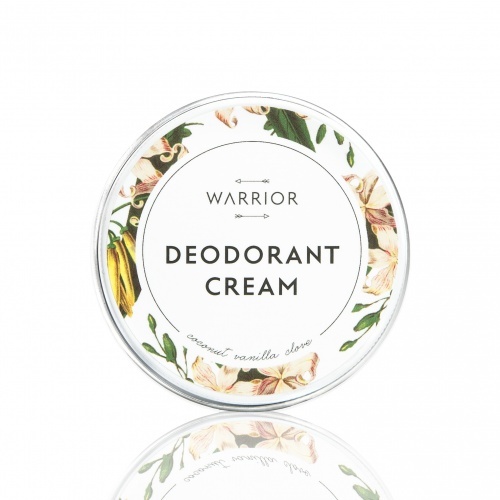 Made with 100% pure coconut oil, organic shea butter and fresh filtered rainwater. Ideal for travel as it takes up very little space. Apply sparingly to wet hair to create a creamy lather and massage into scalp. Rinse thoroughly with warm water. Repeat if desired. Some hair types can go through what is known as a Transition Period. 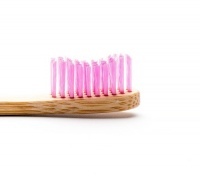 Hair may feel oily and ‘unclean’ for the first few washes. 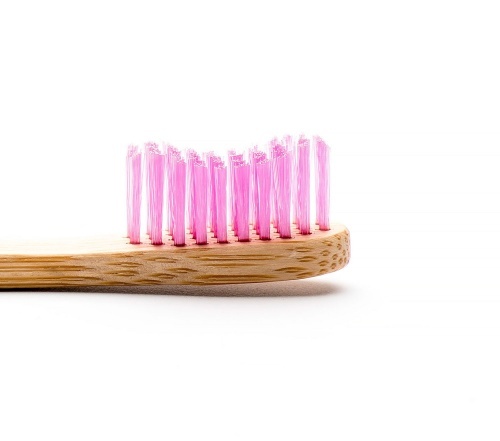 This is the hair adjusting from exposure to potentially chemical laden products and after a handful of washes, your scalp and hair will begin to produce its own healthy, protective oils. An Apple Cider Vinegar (ACV) rinse is particularly beneficial for this problem as it helps restore the natural pH of the scalp and leaves hair feeling softer and shinier. Create your own by mixing 1 tbsp of ACV to 250ml of water, apply to scalp & hair and massage in for a few minutes before rinsing off. Sodium Cocoate (Coconut Oil), Organic Sodium Shea Butterate (Shea Butter), Sodium Oliveate (Olive Oil), Fresh Filtered Rainwater, Sodium Castorate, Organic Apple Cider Vinegar, Panthenol (Vit B5), Organic Carrot Puree Extract (Daucus carota), Organic Arrowroot Powder (Maranta arundinacea), Organic Calendula Petals (Calendula officinialis), Organic Chamomile Flowers (Matricaria recutita).Essential Oils of: Lavender (Lavendula hybrida), Rose Geranium (Pelargonium graveolens), Chamomile (Anthemis nobilis).Naturally Occurring Constituents of Essential Oils: Geraniol, Citronellol, Citral, Limonene, Linalool. The exquisite range of The Palm Free Irish Soap Co visually stunning soaps will grace any bathroom. These beautifully scented bars of goodness contain pure filtered crystal clear Irish rainwater and are nourished with exotic oils of Shea nut, Cocoa Butter and Olive oil to gently cleanse, moisturise and perfume your skin. All soaps are genuinely handmade, they are mixed, poured, cut & individually stamped by hand and are very modestly priced. Palm Free Irish Soap believe that “Beauty Shouldn’t Cost the Earth”. Based on the beautiful shores of scenic Lough Derg in East Clare, Palm Free Irish Soap was born out of the first Handmade Soap Company in Ireland, Gallunac (est’d 1996). They are now at the forefront of producing luxurious handmade Irish soap without the use of Palm Oil or any Palm Oil Derivatives, they pride themselves as being totally Rainforest Friendly. Being a Natural Product, these Soaps DO NOT CONTAIN any Artificial Fragrances, Preservatives, SLF’s Parabens, G.M.O’s or preservatives, they are preserved only by their Pure Essential Oils and Vitamins A, C & E.
Palm Free Irish Soap use minimal packaging, all soaps are sold in a simple recyclable brown paper bag, and all ingredients and products are completely GMO Free and free from any form of animal testing. To gain maximum benefit from your soap/shampoo bar use within 6 months of purchase, if you intend to keep it for longer, please store in a suitable cool dry & dark area such as a drawer. After using your soap, leave to drain on an appropriate soap dish, soap rest or even an upturned nail brush, this will help preserve the life of your Natural Soap. There is nothing actually wrong with Palm Oil itself, in fact Palm Oil is an excellent source of vegetable oil. It is the method by which it is farmed and grown, also where it is planted, that causes the problems. For instance, vast swathes of precious rainforests in Indonesia and Malaysia are being lost on a daily basis, as much as the size of 300 football pitches an HOUR are being cleared to make way for the Palm Oil plantations. It’s not just the wildlife that are suffering, it is also the indigenous people and their heritage that is being lost, their home is made up of over 20,000 flowering plant species, 300,000 animal species and don’t forget about the trees. Given the current rate of clearing, within 12 years the Rainforest as we know them, could be all but a distant memory. The demand for Palm Oil is also responsible for river pollution, land erosion and air pollution. In fact, it has been found that Palm Oil production is the second largest contributor to Greenhouse gases.